The one dog that actually has been the most influential in my life, didn't even start out as my dog. 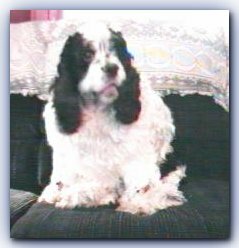 Richard (a friend of mine and Randy's for nearly the whole time we lived in Ohio), originally chose EightBall as his dog. After beginning a family of his own, Richard moved into an apartment where he was not allowed to have a dog. Richard's mom (Joyce) has taken in enough cabbage-patch children of her own (including Randy and me! ), that getting her to take in EightBall (aka "Honey Dog") was an easy chore. Joyce was even kind enough to allow Richard to have EightBall breed while under her care. From that litter, Triumph (formerly known as Bob), Annie, and George (who sired Gabby when he grew up) came into the world. After living with Joyce for almost 5 years, EightBall ran away one day. I spent many afternoons, searching through the neighborhood looking for "my" ex-baby, determined to make her mine again. As mysteriously as she vanished, two weeks later, EightBall finally returned and moved into my house bringing the total count to 6 dogs and 1 cat. For several years now, I have had a running argument with Richard's son (Richie, age 6) as to the ownership of EightBall. [Richie: "She's my dog, EightBall." Once more I have had to deal with the problem of an aging, sick pet when EightBall developed some tumors. Unlike Elektra (EightyBall's half-sister) these tumors were malignant. But once again, I made the right decision to have surgery done. 8Ball recovered and her stitches were removed just before Christmas. 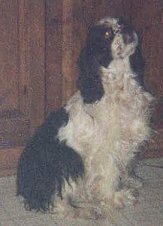 However, she hasn't been getting any younger and another problem put her back in the hospital (the vet's) over the Labor Day '99 weekend. I had just lost Elektra a week and a half before, when one morning, Eightball was unable to get back up the back steps. Throughout the day she was unable to raise herself up but once helped up, she could limp around. After suffering from a massive panic attack, I thought (hoped) that she had only pinched a nerve. When the next morning rolled around and she was no better, I had to call the vet. Leaving her in the vet's capable hands (Mellett Animal Hospital), I went home to wait for a call about the results of her x-rays. I can't say that the prognosis is all that great; but I might not be losing Eightball quite yet. She's suffering from arthritis and a hereditary degenerative spinal disease. Years ago, Apple and Elektra both suffered a painful week or two from this disease at the same time; but recovered quickly, so I'm hoping for the same results now. I've always said that I would go as far as carrying my dogs upstairs to bed every night (heck, even Jodi and I fall up and down them all the time LOL); but they have to not be in pain and able to totter around on their own. Luckily, Eightball improved during her stay at the vet's this weekend. The first update from the vet didn't sound to good, and his cryptic remark about "we'll discuss what you want to do next" left me quite worried. But today's update was much better and I got the good news to come get my doggie and bring her home. She's able to stand up on her own and totter around, so I guess, for a while, I'll be making good on my promise to carry her up and down the stairs. I was hoping that Eightball would be able to handle the winter weather but that became a moot point recently. Her back began to get worse and her health in general took a decisive turn for the worst. Just after Thanksgiving, she got much worse. I asked Richard to stop by (mainly to help me feel that I was getting ready to make the right decision) and he regretfully agreed with my assessment of her health. Visiting Randy's grave (and placing some new flowers) on Dec. 1st, I asked him to please be on the look out for Eightball who would be joining him the following day.